The moment you surrender your life to Christ, a checkered flag is waved and you’re off to the races…on the greatest adventure of your life. It’s a race that’s already been won, yet one you’re committed to run for the duration of your existence. And it’s a race the men of MercyMe have been running for awhile. After 23 years as a band, Bart Millard (lead vocals), Nathan Cochran (bass), Barry Graul (guitar), Mike Scheuchzer (guitar) and Robby Shaffer (drums) are in it to win it. And their relentless commitment to faith, music and the gospel shows no signs of slowing down on their ninth studio project, aptly titled LIFER (Fair Trade Services). The beloved band’s storied career speaks to the endurance of its members and the timelessness of its music. With more than 9 million units in cumulative sales, MercyMe has seen 27 of their songs reach No. 1 across multiple Christian radio formats, in addition to garnering four mainstream radio hits. Their landmark song, “I Can Only Imagine,” was the first digital single in Christian music history to be certified platinum and double-platinum. Billboard named them the Christian Artist of the Decade in 2009. In addition, they have multiple GRAMMY® nominations, GMA Dove Awards and American Music Awards to their credit. 2014’s Welcome to the New proved to be one of the biggest releases of the group’s career, earning them two GRAMMY® nods and four long-reigning No. 1 smashes at radio. The album continues to be a top-selling title from a band that has been churning out hits for more than two decades. Millard grasped the concept of the no-strings-attached grace that Christ offers…and it literally changed him from the inside out. And now, LIFER serves as the next natural chapter. If Welcome to the New’s central message was grace, LIFER’s core message is triumph. While the band spent the last three years telling fans they can be made new in Christ, with LIFER they wanted to acknowledge that while that is indeed true, it doesn’t always mean life is easy. So, on this album, they set out to explore how a believer can navigate the race with enough perseverance to make it to the finish line. While Millard & Co. are excited about the message behind LIFER, they’re equally excited about the musical direction. LIFER picks up right where Welcome to the New left off, turning the veteran band’s tried-and-true formula on its head and giving them permission to experiment. 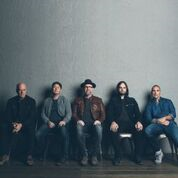 Produced by Ben Glover and David Garcia—the same duo behind Welcome to the New—MercyMe recorded LIFER in three different studios in and around Nashville, including Zac Brown Band’s Southern Ground Studios and an old barn-turned-studio near College Grove, Tenn. While the most intensive part of the recording process occurred in the final quarter of 2016, the band wrote one of the album’s standouts early on. “We Win” was written and recorded in record time and essentially became the cornerstone track for the entire album—a rally cry for those in the trenches. Other selections were an overflow of the abundant writing the band did for Welcome to the New. The breezy, soulful “Grace Got You” is a gift from that cutting room floor. “Every once in a while, your lyrics and your music line up just right and you envision it stirring a certain emotion; and when it happens in the studio, it’s a pretty intoxicating feeling,” Millard shares of the song, which features a bridge rapped by John Reuben. The driving tribal rhythm of “Hello Beautiful” counters the enemy’s lies with God’s truth. While campfire closer “Ghost” speaks to the irony and mystery of the Holy Spirit exposing some of the most creative lyrics of the band’s career. Millard was thinking of his 15-year-old son, Sam, when he penned the song. Sam has been a diabetic since he was 2, and it’s been an uphill climb for the frontman and his family ever since. One day, Millard shared his frustration with the ongoing thorn in his son’s side with his friend and fellow songwriter Tim Timmons, who battles an incurable cancer himself. Following their conversation, Timmons sent Millard a demo of a chorus he had co-written with Crystal Lewis years ago. Millard took the idea and ran with it, quickly writing the remainder of the cut through tears. “The whole point of the song for me is the change that Jesus made in my life is so real and so life-transforming that if He went dark, if He went silent from now on, He would still be my greatest hope because of what He has already done,” he shares. “Basically, there’s not a single circumstance, I pray, that can derail me from what Christ is to me and who I am because of Christ. While his lyrics are often born out of reconciling his faith with real life, Millard doesn’t claim to be a theologian. He’s careful to run every lyric by trusted pastors and friends to ensure every line he writes is sound. “I can’t express how much I’ve slaved over lyrics to make sure they’re understandable and people don’t get sidelined by something and miss the whole point of the record,” he says.